My name is Michelle and I have lost 3st 3lbs45lbs20kg in just 5 months with Nutracheck. Last August I went for a family day out at Drayton Manor, and had a great time. When I got home and saw the photos I couldn't believe how big I looked, I had put on so much weight without even realising! I searched the App Store and came across Nutracheck so thought I would give it a go, as there was a 7 day free trial. 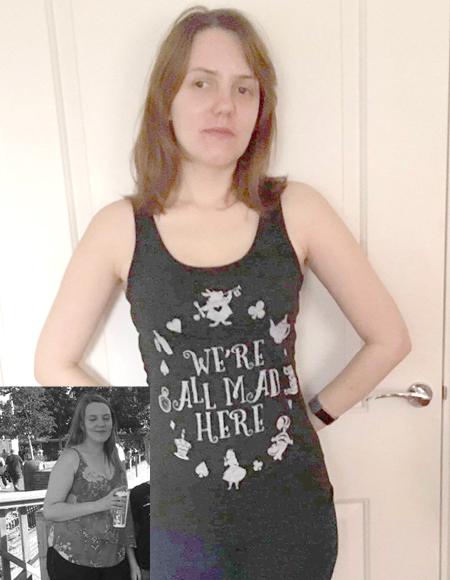 My weight has slowly increased over the years but I just bought bigger clothes, as I wasn't that big only a size 12, then only a 14 then only a 16, I was in complete denial about my weight. I found the app so easy to use. All I had to do was add what I ate and drank, nothing is off limits! I could still eat cake and chocolate. The hardest part was cutting down on the treats and recording everything but now it's just second nature and I enjoy my treats so much more, as I'm more mindful of my eating without even thinking about it. I feel so much healthier and happier and am now a size 10 and at my ideal weight/BMI, the smallest I have been since I was 14! I have done 10,000 steps a day with no other exercise and I still lost weight! I can't recommend Nutracheck enough, it's so cheap and easy to use and it's free for 7 days to try it out. You have nothing to lose except all those extra pounds! You can engage in forums and blogs that are full of other members to cheer you on and give you delicious recipe ideas. It has changed my life I have taken control of my weight and am so much more confident.